So says music industry legend Clive Davis, executive producer of the exciting, new tribute special, "Aretha! A GRAMMY® Celebration For The Queen Of Soul." Broadcast on the CBS Television Network, this musical, 2-hour special salutes the extraordinary career of 18-time GRAMMY winner Aretha Franklin. An incredible mix of both new and distinguished talent gather to pay tribute to the legendary Aretha, covering many of her top hits and favorites. In addition to once-in-a-lifetime performances by Kelly Clarkson, Alicia Keys, John Legend, Janelle Monáe, and more, some of the evening’s highlights included the astonishing opening medley of “Think,” “Ain’t No Way” and “Respect” by the incomparable Jennifer Hudson; recent GRAMMY winner H.E.R. performing her own soulful rendition of the beautiful “I Say A Little Prayer”; the brilliant Celine Dion wowing the audience with her take on “A Change is Gonna Come,” a song once memorably covered by Aretha; music newcomers Chloe X Halle performing their playfully applicable version of the smash, “Sisters Are Doing It For Themselves”; songstress Andra Day hitting all the right notes while belting her way through Aretha mega-hits “Chain of Fools and “Freeway of Love”; and the evening’s feel-good finale of “Natural Woman” performed by the extraordinary ensemble of Alessia Cara, Brandi Carlile, Day, Fantasia and SZA. Hosted by actor and filmmaker Tyler Perry, other performers who joined the salute included Yolanda Adams, Common, Patti LaBelle, Rob Thomas, and a special appearance by the great Smokey Robinson. From her hugely successful hits to her renowned charitable efforts and civil rights activism, Aretha Franklin was a remarkable woman whose music, and life, is fittingly honored in this exceptional music special, "Aretha! 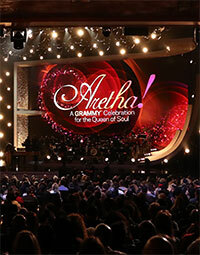 A GRAMMY® Celebration For The Queen Of Soul."